Other names I have known them by (in somewhat of a chronological order through my lifetime): the cops, the rozzers, boys in blue, the law, plod (after the policeman in Noddy), peelers (from Sir Robert Peel) the fuzz (or fuzzies), pigs, dibble (after officer Dibble in Top Cat), the filth, 5-oh (after Hawaii 5-0, of course), the bizzies, Babylon, po-po (from The Wire - totally fabulous TV show). Wikipedia has a whole A-Z - I admit that I had forgotten a few of the above until I read through that and refreshed my memory! I didn't realise it at the time but the prevalent colloquial name of "the pigs" that was mostly used in Yorkshire when I was growing up was first popular in the 19th century, went out of use, and subsequently came back in. 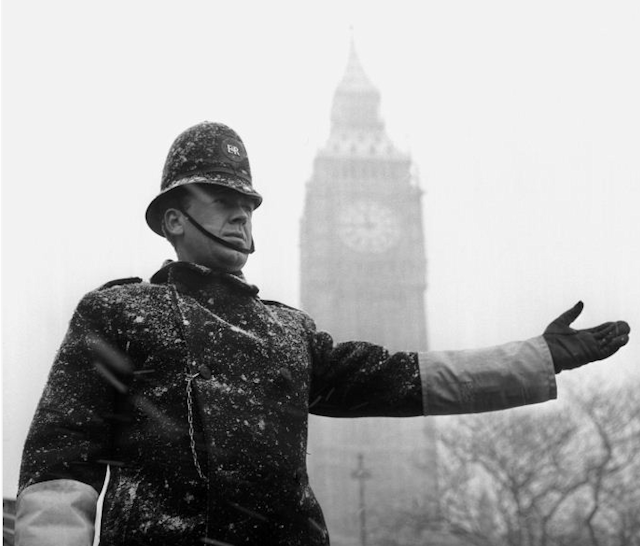 We also had the Old Bill to thank for many of the excellent UK 70s police drama shows of my childhood like Z-Cars, Dickson of Dock Green, The Sweeney to say nothing of all those that came after those, and continue to be made. I recently came across Old Bill and had never heard it used as a police officer before. I've come across many others like Johnny, Philip, Nicks, etc., but never Old Bill. I was curious as to where it came from, and like you said, there are a number of different theories. Sadly, I don't think the Old Bill is the only thing that is becoming extinct these days. The old bill nicked me, put me in front of this beak, and now I'm doing bird. Ha! Yeah but I bet you was Brahms on the frog, mate - should have called a sherbert for yer lazy Khyber. When we were younger, my brother used to call them "discobar de blauwe streep" ("disco bar the blue stripe", a quote from one of the TV programmes we used to watch way back when), or the smurfs (in reference to their blue outfit). There are a couple of other ones, but none of them make sense when you don't speak Dutch, so it's no use mentioning them here. Belgium, dear Ed, Belgium. And nope, they just wear a dark blue uniform. Not even the bright blue Smurfs are known for. It's just a thing the kids invent, what can I say. Lol, no, they don't have magical powers. Except maybe Papa Smurf, but he makes potions. Are potions magic? Or are they just medicine of questionable nature? The lightest term we have for them in Greece is also "smurfs". The others lose their power in translation. But, if you've watched footage from riots in Athens you'll see that the citizens don't like them all that much. It's more scorn than respect. Are you assuming that *just* because I'm a guy it *must* be a football reference? That it's utterly inconceivable that he could be a famous Dutch ballet dancer, or fashion designer, or flower arranger? Just because I'm a guy? Pff. Well ... not that it's important, but it just so happens that Marco van Basten *is* a footballer. Quite a famous one too. So there. Stop looking so smug. I love the old style hat and uniform. I think in our society, The Police are dressed in a manner that incites conflict. They are geared up for conflict and in turn some people view that as intimidating and they will not live under that yoke, and on the other hand you have these people in society that wouldn't respect the old bill and they needed to adapt to the ever evolving criminals. But I have great respect for (The Black Bastards) as they are called in Gods Ulster Sky. Wouldn't mind being 1 myself. I agree that British uniforms in some forces are becoming more authoritarian looking. And the police in Ulster are a particular case - with armoured vehicles and stations that look like fortresses.